Players (anyone with a cue) are the heart of the system. This is a players site and we are asking for your comments to make it even better?..We are devoted to providing rich technical content for anyone in the industry to use. We collect stats in several ways by providing many Scoring Tools to accommodate the various existing formats and make it easy and fun. We are constantly adding ways to improve the management of contest and for the players to make and earn money. Common universal stats are the missing link for expanding our sport. >Download the >Click StatMaster W-L Submit Form and enter the required information from an Event and email it back to us. >To play in the SUPER8 Tournament EChart System you must be a paid Registered Player. 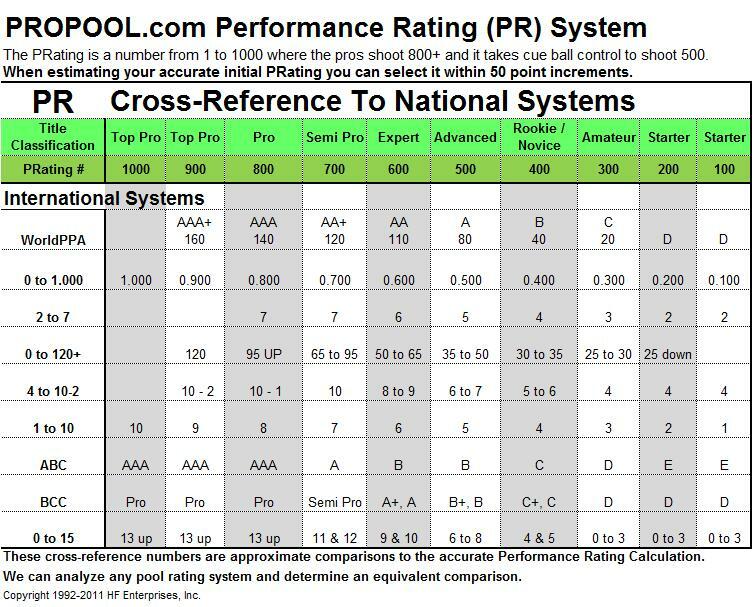 Worldwide Universal Billiards Performance Rating, PR:The PRO STATS system is an accurate shot by shot online EScore Card with a PRating Calculator. You can see how you shoot against the pros immediately. The PR is a skill level number that indicates a player??????? ?s performance on a single game to a series of games. We provide a written description as a reference for a new player when estimating their initial PR fairly accurately to within 50 points. The estimated PR can be adjusted by comparing it to other players. We also, have a cross reference table that compares the PR against several common systems giving any player a quick way to compare their performance to the pros and other players regardless of organization affiliation. Go to the PLAY NOW page to get started. >As we locate and upload other current and historical tournaments or event we list a universal Performance Rating PR representing the players performance for the specific event or league. Some historical tournaments have calculated ratings posted. We can develop a merge program that takes into account the converting system and post a more accurate estimated rating. Once players are listed from any event they can have their personal profiles updated as necessary by using the EScore Card Program. However, the preferred method is to use the online EScore Card & PR calculator to get an accurate mathematically calculated number from 0 to 1000. This can be used in a 1 on 1 Match>Up Challenge or part of a tournament. It also adds a great deal of interest, when using it real time during video tapped matches. A) Pro Stats shot by shot scoring with a calculated Performance Rating PR. B) Matches Won, Games Won & Games Lost. The Stats Leader Board is typically sorted by Matches Won MW. This allows lower rated players to be high on the list by just volume. E) Or Use the ECharts that automatically run tournaments and collect stats. For Free programs go to the ECHARTS Page and the HOW TO PLAY? Page for more programs. 1) Our first level of validation is a default to rely on the two competing players to ensure their stats are correct. 2) The second level is to have a third party witness, which is ALL the other players in the Venue, tour or area. 3) And the third level if necessary, is to include a Venue or Event Representative to VALIDATE the scores. Note: Every shot is measureable, so a referee can make an accurate determination. Our Free Shot Handicap is the best way to fair up the players in one game without reqiring long matches. We developed and applied it while playing with Rodney Morris in June 2012. We advocate a performance based rating, which is a basis for handicaps. Ideally, competing players should be grouped by skill divisions, which make it much easier to manage and more fun for the players. Handicaps add another layer of complexity to the payers concerns at a tournament, especially for a wide skill range. However, handicaps do exist and are common, so it helps to have an accurate rating to work from. Most ratings and handicaps have big steps from one skill level to the next. That’s not reality. A Player skill varies quite a bit from several contributing factors. Using a handicap that is fixed until it is manually changed from one level to another is brutal. Using the 1 – 10 method as an illustration shows the weakness. A) If a high 6 plays a low 6 that??????? ?s a substantial skill difference, yet the players play even and B) If a high 5 plays a low 6 it??????? ?s a game handicap yet the players are even in skill level. This method only encourages “sandbagging” fear and effort to try to stay from a new high number, which never goes down. There is no way to have this system accurate and current??????? This is a very weak system in these hi-tech days. Our FREE Shot Handicap is the best way! Our PR floating system using the 0-1000 span, gives plenty of fine adjustments to identify a player??????? ?s accurate rating and handicap. Currently we are suggesting 75 points per ball (Free Shot). If a 450 player plays a 520 they play even. If a 425 player plays a 505 player that??????? ?s 1 Free Shot during the game). Players and directors can determine their own ranges.